UNITED NATIONS, January 8, updated -- As France's Bernard Kouchner strode through the UN basement, an amended version of the Libyan introduced draft Gaza resolution emerged, this time with the word Hamas in it. The draft call for a cessation of "Israeli military operations and and firing of rockets by some Palestinian groups, including Hamas." For the UK, it includes a reference to preventing "the illicit traffic of arms." For France, it cites "the ongoing diplomatic initiative" that Nicolas Sarkozy would still like to call the Franco-Egyptian plan. For the US, there's a call for "secure borders" for Israel. But even at 10:30 am, the spokesman of a Western Council member said it wasn't clear if they would vote for the resolution. A senior diplomat from an Asian Islamic country told Inner City Press that Libya should have had these concessions in its draft from the beginning, that to begin so one-sided ended up wasting time. This country was among the requesters of Thursday afternoon's special session of the General Assembly. But if a resolution passes, the tenor of that meeting too will change. GA President Miguel d'Escoto Brockmann, it is predicted, will claim credit for the resolution's passage -- if it passes. Soon, though, it was said that France and the U.S. had cooked cooked up their own resolution overnight, apparently giving up on the Presidential Statement they floated Wednesday afternoon. At 10:35, Condi Rice emerged from the brief meeting with the Arab ministers. "I'll be back." The UK's David Miliband said the day is young. They thought up these pearls of wisdom overnight, in the Waldorf. In Conference Room 7 across from the Arab ministers' confab, a sign advertised a UN meeting on "Brain Education." What other kind of education is there? After midnight came news of rocket fire from Lebanon. Soon it emerged it was only four rockets, injuring two. But perhaps the specter helped focus the mind. Call it brain education. To be continued. Update of 1:59 pm -- while General Assembly President Miguel d'Escoto Brockmann held a press conference denouncing the Security Council and Presidents Bush and Sarkozy, French foreign minister Bernard Kouchner strutted once again from the 2nd floor P-5 consultation room down to the Arab ministers' haunt in the basement. Sources tell Inner City Press that we are getting to crunch time. For an interim story on the origins of the changes to Libya's draft resolution, click here. 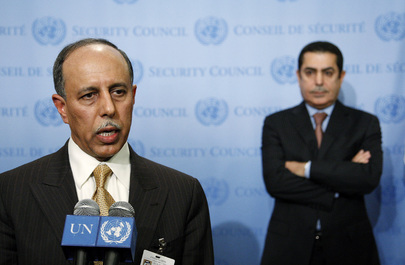 Update of 2:25 pm -- after Condi Rice and Kouchner come out of Arab meeting, Arab League's Amre Moussa tells the Press, we cannot wait any longer, the Security Council will be requested to vote this afternoon. Game on. Update of 3:53 pm -- in the crowded scrum of the UN basement, in the wake of Condi Rice and Kouchner, word comes of formal Council consultations at 5 pm. All wonder about a vote, and on what. An hour thrown about is 8 pm. To call for a ceasefire is one thing, for a "complete withdrawal" is another. Others note: Condi walks unsteadily on her high heels. Who knew there'd be so much walking today. Update of 4:12 pm -- word is, agreement has been reached or very close. More incalcitrant Arab Group members disappointed in "sell-out," the call for withdrawal not clear enough, Israel can interpret it its way. Ceasefire "leading to" withdrawal. And some push to delay vote to Friday, to allow one last push. Update of 6:57 pm -- A gaggle has gone into the Council chamber, including Ban's senior advisor with the Russian Deputy Permanent Representative. Ban would come down for a vote, he says. There's talk of a final amendment. The Libyans predict a vote in two hours. We'll see. Update of 7:17 pm -- At the stakeout, UK Ambassador John Sawers told the Press, "it's in blue," or, formally tabled. Down in the basement, UK's Miliband called it historic. Amre Moussa added, "Security for the people in Gaza, not just Israel." In Arabic he said, they wanted to postpone but we refused, so now we'll vote." It's all systems go. Update of 8:47 pm -- things must be getting close, because Ban Ki-moon is schmoozing the room, chatting with Egypt's foreign minister. A resolution about to be passed has many parents. Update of 9:15 pm -- while the President of the Council wouldn't say, staff say the delay is "procedural stuff," translation into Arabic. But why then have Ban Ki-moon and ministers milling around for so long? But now the bell rings and it begins. Update of 9:49 pm -- after Condi Rice surreally says the resolution she has just abstained on is a good road map, Costa Rica's Jorge Urbina thanks Kouchner for promoting him to Foreign Minister. The speakers' list includes Palestine, Saudi Arabia and Egypt -- but not Israel. In the balcony of the Security Council, nearly every ear piece is broken. Update of 10:08 pm - the 15 Council members are done, Burkina Faso having said "better late than never." Now the foreign minister of the Palestinian Authority puts the number of dead at 760, "forty percent of them women and children." The Qataris, pictured above, come to stakeout, speaking only or first in Arabic to dwindling reporters. They leave without taking any questions. Will Condi and Israel speak? Update of 10:45 pm -- it ends with a whimper and not a bang. The UK's David Miliband floated by the stakeout out. A few words? "I've said so many words," he said and was gone. Condi Rice did not even pass the area. Amre Moussa spoke, and Inner City Press asked him for his interpretation of the line "leading to the full withdrawal of Israeli forces from Gaza." Fast, he said. Then that he had to get to the airport. Japan's Permanent Representative Takasu, asked the same question, noted that the Arab Group had wanted an immediate withdrawal, but the adopted text was different. Still it should be fast, he said. How fast? He wouldn't answer. The Palestinian Authority's foreign minister predicted at least two more days of bloodshed, that Israel will claim it can't implement the ceasefire portion of the resolution over the Sabbath. The Israeli mission handed out one copy of Ambassador Shalev's short statement, but she did not come to the stakeout. The soda machine was sold out, the coffee machine had run out of cups. The lights were turned off and the vacuum cleaners started.